Maxwell AFB, also known as Maxwell-Gunter AFB, is located in Montgomery, AL. The host wing is the non-flying 42nd Air Base Wing. Maxwell is the headquarters of Air University, a center of multiple institutes and schools, which is part of the Air Education and Training Command. 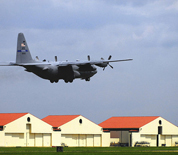 The 908th Airlift Wing, a tenant unit, is the only operational flying wing on base. Gunter Annex falls under command of Maxwell. As the capital of Alabama, Montgomery offers many museums, parks and professional sports areas for personnel stationed at Maxwell. It is also an approximate 3 hour drive to Alabama's Gulf Coast beaches. This Maxwell AFB directory features the critical info you’ll need to navigate through the many facilities and recreational opportunities available on base.